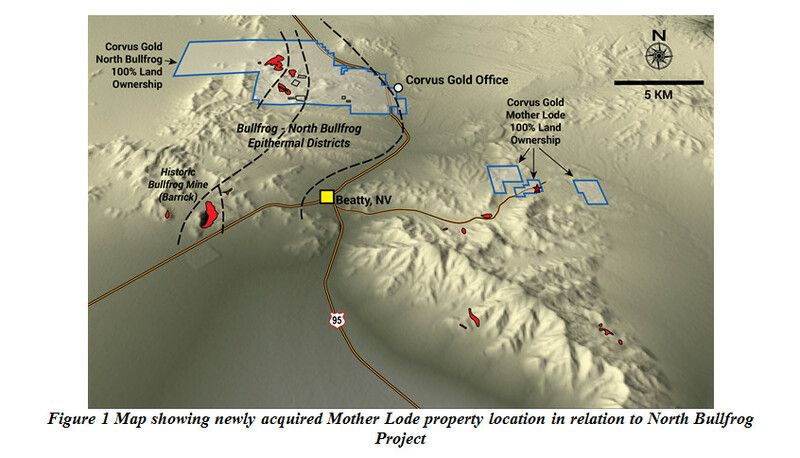 Corvus Gold Inc. announces the agreement to acquire the Mother Lode property in Nevada from Goldcorp USA Inc. (Figure 1). Corvus Gold plans to purchase 100% of the Mother Lode property, covering approximately 250 acres and containing a historic (non-NI-43-101 compliant) resource of 8.5Mt at a grade of 1.6 g/t gold totaling 430,000 ozs of gold. In addition, Corvus Gold staked two additional adjacent claim blocks to Mother Lode totaling 1,040 acres, covering areas of exploration and development potential. The Mother Lode property approximately 10 kilometres from Corvus Gold's North Bullfrog project with potential for a large satellite operation. Jeff Pontius, President and CEO of Corvus said, "The acquisition of the Mother Lode property is an important addition to Corvus Gold. Mother Lode hosts a series of thick, shallow dipping, stacked mineralized bodies averaging 1.6 g/t gold. These mineralized bodies are open for expansion along with a number feeder structures averaging over 3 g/t gold. We intend to initiate a substantial exploration and resource development program at Mother Lode this summer. Corvus Gold is also on track to complete its update of the North Bullfrog resource and Preliminary Economic Assessment study this fall. 2017 will be an important year for Corvus Gold with several major company expansion projects taking place." The Mother Lode deposit was mined in the late 1980's when gold price was about $400/ounce. Low gold prices made the operation uneconomic and resulted in the closure of the operation in 1989 after less than 3 years in operation which produced 34,000 ounces of gold. The Mother Lode project is similar in age to the historic Bullfrog Mine and the newly discovered North Bullfrog project and is hosted in both Tertiary volcanic-sedimentary rocks and Paleozoic sedimentary rocks. The mineralization occurs as low angle, north dipping, near surface, tabular bodies of mixed sulfide and oxide mineralization. Key structural controls in the deposit appear to be a series of north northwest high angle structures which have acted as conduits for mineralizing fluids (similar to the YellowJacket deposit at North Bullfrog). An important untested target for additional high-grade mineralization is the intersection of the major, low angle east-northeast trending Fluorspar Canyon Fault Zone and the high-angle N-NW trending feeder structures approximately 50 metres below the existing Mother Lode deposit. The historic estimates for the Mother Lode property contained in this news release should not be relied upon. These estimates are not National Instrument 43-101 ("NI-43-101") compliant. While the Company considers these historical estimates to be relevant to investors as it may indicate the presence of mineralization, a qualified person for the Company has not done sufficient work to classify the historical estimates as current mineral resources as defined by NI 43-101 and the Company is not treating these historical estimates as a current mineral resource. For additional information on the North Bullfrog project, including information relating to exploration, data verification and the mineral resource estimates, see "Technical Report and Preliminary Economic Assessment for Combined Mill and Heap Leach Processing at the North Bullfrog Project, Bullfrog Mining District, NYE County, Nevada" dated June 16, 2015 as amended and restated May 18, 2016 which is available under Corvus' SEDAR profile at www.sedar.com.